McKay-Dee’s cooks created several recipes for the hospital’s Live Well program, including a LW Chicken Broth that is a key ingredient in several menu items. “Live Well simply means better for you,” Nielsen says. For the minestrone base, the kitchen adds extra water to the broth concentrate, which reduces sodium without noticeably changing the taste. Adding a little sugar brings out the flavor of the vegetables. 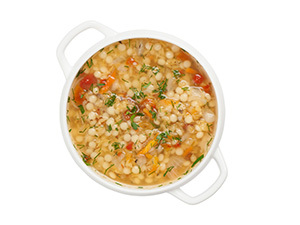 Quinoa provides a high-protein filler compared to pasta, and the canned garbanzo and great Northern beans Nielsen specs for the soup are lower in salt. A variety of fresh vegetables, including zucchini, kale and green beans, brighten the flavor and create a colorful dish—a key selling point for a healthier item, she says. “We usually have the prep team chop all the ingredients, but for this soup, we have the cooks chop fresh rosemary and thyme to add at the very end. 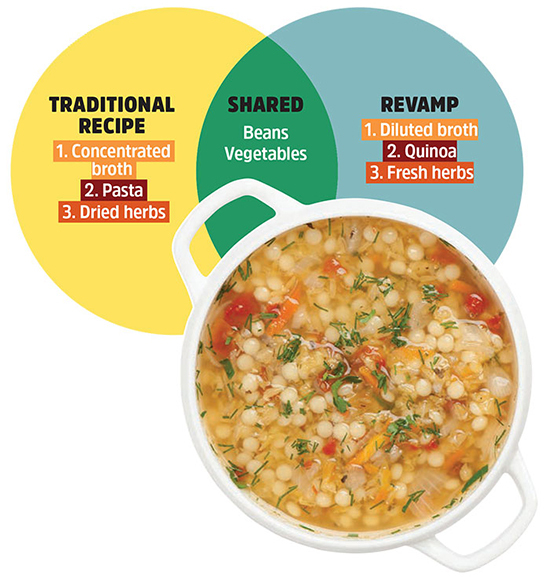 It makes the flavors in the soup really bloom,” says Nielsen. The soup is dished up at McKay-Dee’s retail cafes and is available on the room-service menu for patients.